A recent study from the UK showed what many Reproductive Medicine specialists noticed for some time, that a couples' chances for success with IVF vary based on ethnicity. In this paper published in the British Journal of Obstetrics and Gynecology, IVF success rates varied by race with white women having the highest pregnancy rates, followed by women of Southeast Asian descent, then African descent and then Middle Eastern descent. The reason for this is not at all clear. The number of eggs women produced, how many fertilized and the number of embryos transferred, did not differ based ethnicity. 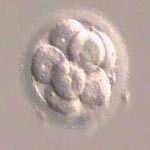 However the implantation rate (the percent of transferred embryos that took) did differ among the groups. Why the embryos of some ethnic groups would be more likely to implant than others remains the big unanswered question.